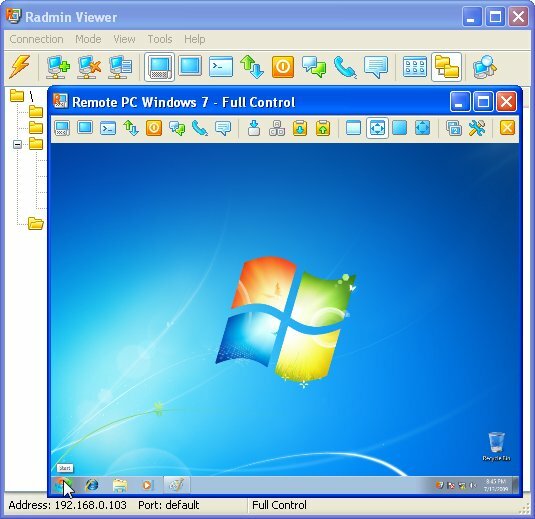 Radmin is a fast remote admin tool for network management and a solution for remote access of computers via Internet or LAN in multiple modes: remote screen view only, remote file access, full remote computer control, Telnet, text and voice chat. Radmin Viewer - Free Tool for Remote Hardware Management of computers based on the Intel vPro platform over Internet or LAN. Performs Remote Turn On, Cold Reboot, BIOS Remote Control, Network Boot of the remote computer with Intel AMT (Active Management Technology). Radmin Deployment Package - Radmin Deployment Package makes Radmin Server installation and setup very fast. Using these programs, a system administrator can install, configure, activate and upgrade Radmin Server on every workstation on a local network of any size. Advanced IP Scanner - Advanced IP Scanner is a free, fast and easy-to-use multithreaded network scanner. Its many useful functions include scanning for HTTP, HTTPS, FTP and shared folders, improved integration with Radmin, and remote shutdown and wake up! Instant Housecall Remote Support - View and control remote PCs through firewalls in seconds. Securely access attended and unattended remote PCs without pre-installed software. Reboot into safe mode, auto-reconnect, track session history, Vista/UAC and more. Remote Viewer (pc remote access) - Remote Viewer (pc remote access) is a pc remote control product, which enables you to control your computer remotely via any web-browser. The download includes an SDK for developers interested in implementing custom remote control applications. Remote Desktop Manager - We believe in a world where remote connections are unified, security is strong but manageable and team work is achievable. With its user friendly interface, Remote Desktop Manager is the answer. LANVisor - LANVisor allows you to see the screens of multiple computers connected to the local area network. You can use the software to see what users do on remote computers and automatically take screenshots. Radmin Communication Server - Radmin Communication Server is a new, secure solution for real-time corporate communications. It can also serve as a secure instant messaging tool, a solution for online conferencing, and a corporate multi-user text and voice chat for employees. Remote Control Tools - JurikSoft Remote Control Tools - software for remote administration of computers under OS Microsoft Windows 2000\XP or Windows Server 2003. This software products are develop using Microsoft .NET technology for current and future OS from Microsoft.